The best grandpa birthday wishes, like the ones here, have just the right words to show your grandfather he's truly special, making his birthday a celebration (and tribute) to remember for years. And the best kind of grandfather birthday messages excel at old-fashioned charm, the type that will make him feel like he's being fussed over by you (just what he needs on his special day). Your Grandpa may not ever say it out loud to you but every loving, caring, affectionate, compassionate, playful and inspiring word you put into his birthday greeting is sure to make his heart swell and his soul soar. You'll find many examples here. 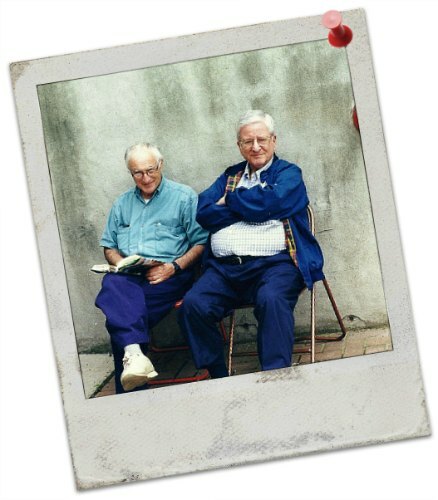 My father and father-in-law: Two of the best grandfathers I've ever known! Their legacy of love is behind every birthday wish in this section! My father and father-in-law, when they were alive, were incredible granddads to my son and daughter. Whenever one of their birthdays rolled around, my children made sure to let them know just how wonderful they were — with the heartwarming birthday messages weaved into every grandpa birthday greeting on this page (and the next). If you're lucky enough to have an amazing grandfather (or even two amazing grandfathers), sending or giving him a heartwarming birthday message that makes him feel truly special on his birthday is always a nice idea. But not all granddads are created equal, so what's totally right for one may be completely wrong for another. You need to first determine what type of granddad you have. Once you figure it out, you'll know the right kind of birthday wish to send or give him (based on my suggestions). According to my research, there are five basic types of grandfathers (and grandmothers, for that matter). Which "type" is yours? Below is each kind of grandfather, along with what I think is the best birthday message style you should choose for him. The warm and fuzzy grandfather - Choose sentimental birthday wishes. The strict and stern grandfather - Pick so-called "happy" (the term I use for "generic" on my site) birthday wishes. 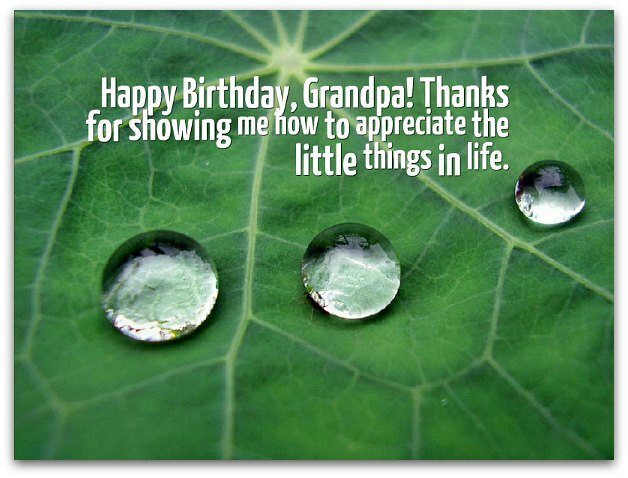 The super-spoiler grandfather - Select sentimental or cute birthday wishes. The hovering helicopter (know-it-all) grandfather - Choose clever or happy birthday wishes. 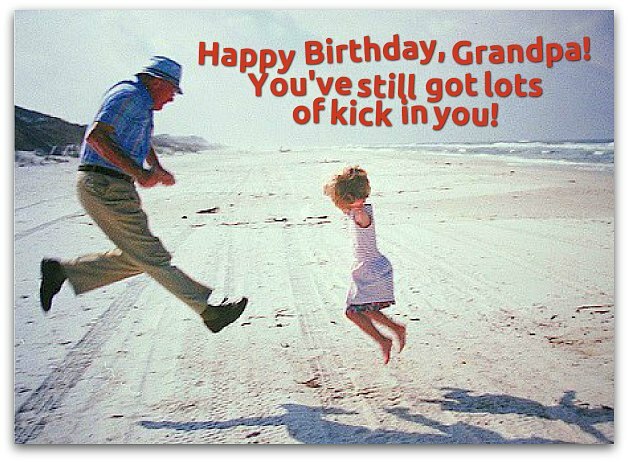 The reluctant grandfather - Pick clever, cool or inspirational birthday wishes. To be sure, there are other types. For more, check out this article: Five types of grandparents and how they shape our lives (Which type of grandparent did you have?). It's definitely worth a few minutes of your time. Whenever we fall, your arms comfort us. Whenever we succeed, your arms comfort us. Your love is comforting and we’re comforted by the fact that you will be here for many years to come. We love you, Grandpa. Happy birthday. Happy birthday, Gramps! On your special day, I'm delighted to announce that, once again, you've won the "World's Most Awesome Grandpa" Award (secret: I was the judge). Happy birthday to an awesome Grandpa and an even more awesome friend. Grandpa, you're one in a quintillion. Happy birthday! With age comes the knowledge that it's the people — not the things — in my life that really matter...especially you, Grandpa. I love you. Happy birthday. Thanks for being such a great granddad to me. Happy birthday, Grandpa! Despite everything we do badly (or not at all), you love us unconditionally. We're so lucky to have you as a grandfather. Happy birthday. You're more than just a grandfather to me — you're my role model in life. Happy birthday, Grandpa! May you always be happy and healthy. Happy birthday, Grandpa! Still on the lookout for the perfect choice? Thank you for being a kind and caring Grandpa. Happy birthday! You're more than a Grandfather. You are an inspiration, a true role model. I love you, Grandpa! Happy birthday! Like a vintage car, your value increases year after year! You're priceless in my eyes. I love and respect you so much! Happy birthday, Grandpa! Grandpa, you're a sea of love, caring and wisdom that brings endless waves of joy and wonder to my life. I love you. Happy birthday! You're not just my Grandpa — you’ve also been my mentor, confidant, inspiration, playmate and partner in mischief from the moment I could walk and talk. Happy birthday, Gramps! Your birthday should be a national holiday, because you're a national treasure, priceless to our family! Happy birthday! Your birthday is about you and all the wonderful things that you have done in your life. What a great life you’ve lived! Happy birthday to my great Grandpa! A hundred candles to light up your birthday cake would not equal how much light you bring into our lives. We love you, dear Grandpa. ! Happy birthday! I have learned so much from you, especially about the power of friendship and love — from your love and friendship. Have a great birthday, dear Grandpa.